Thank you so much for taking the time to read about us! Friendly Neighborhood Health Clinic is owned and operated by Tami Dittburner . 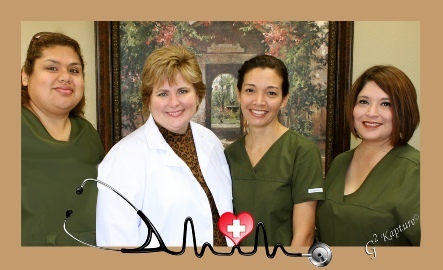 Tami has over 25 years of experience in managing the health care needs of adult patients. Our practice provides comprehensive primary health care, including health screening, complete physical and laboratory examination, vaccination, and wellness counseling. Tami manages all women's health care needs, including routine Pap and pelvic assessment, family planning and birth control, sexually transmitted infection (for men and women), and menopause. Tami holds national board certification in adult practice and womens health, in addition, she holds a certification for advanced training in obesity medicine. We also manage the spectrum of chronic conditions, including asthma, COPD, diabetes, hypertension, heart disease, peptic ulcer disease, gastroesophageal reflux disease, arthritis, osteoporosis, thyroid disease -- just to name a few! We find that the management of chronic disease is much more successful for the patient when there is a strong patient-provider relationship. Of course we have an extensive network of specialists with whom we consult when your condition requires, but you can rest assured that your primary care provider is making sure you have the best care -- with no loose ends! We also have a collaborating physician, Dr. Elizabeth Juarez who is trained in internal medicine and is currently practicing as a hospitalist at Harlingen Medical Center, and Dr William Torkildsen. Friendly Neighborhood Health Clinic is also ready, willing, and able to manage all of your acute care needs. Of course if you have a medical emergency then you need to go to the emergency room, but if it's not an emergency, come see us! We reserve time every day for same-day appointments, so that you don't have to wait for hours. We manage all variety of allergies and infection, such as upper respiratory (head cold and bronchitis), sinusitis, conjunctivitis (pink eye), pharyngitis (sore throat), otitis (ear infection) urinary tract infection, skin rashes and lesions, fever, and most other things minor acute conditions. We are dedicated to developing relationships with patients and families, and being your primary care provider for the long term.